There are two types of people sitting at desks throughout the world. There are files people and then there are piles people. I like to think of myself as a files person and yet when I look at my desk I know in my heart of hearts that I am a piles person. Maybe I am one who aspires to be a files person with everything neatly filed away providing me with a clear, clean and uncluttered desktop. The Freedom Arm for iMac is helping me move in that direction. This well engineered machine does its job with understated elegance and quiet proficiency. 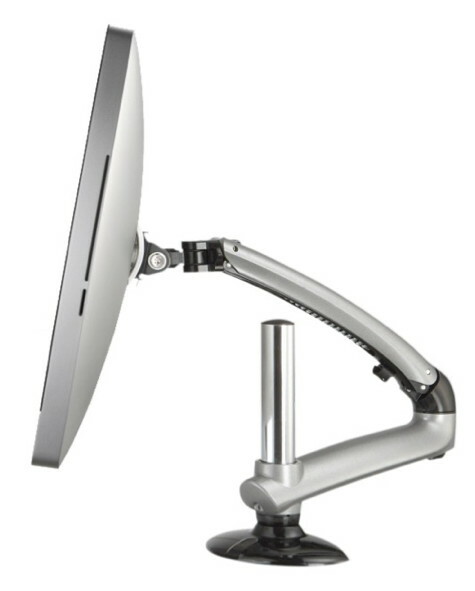 It replaces the foot that the iMac stands upon with an articulated arm leading to a gleaming chrome post that clamps to the back edge of the desk. Clearing the area under the iMac and leaving a sweeping vista of clean, dust free desktop or perhaps making more room for a couple more piles of VIP (Very Important Papers). The built-in clips on the underside of the arm serve to lift the myriad of cords and cables, so vital in this connected computing world, off the desk and hiding them in an effective manner. Providing display movement that iMac users hadn’t even dared dream about in the past. With gentle pressure the display will move up, down, closer, further away, left, right, swing, tilt and rotate. In essence one can position it anywhere in 3D space within a couple of feet of the mounting post and reposition it as often as your needs change. This delightful Ergotech system is available in three colors, white, metal gray, or silver, and it works with the flat panel iMacs that have a single foot. The exception is the latest razor-thin iMac. This exception can be overcome with a Build to Order option of a VESA mount. This special order installation takes away the foot. If you need one, let me know, I now have an extra. The time required for installation was one hour for me from sealed box to working computer, although this included cleaning a few years of dust and fuzz babies from that part of my desk that had been hidden from me. The hardware has plenty of adjustment for different installation needs but the manual fell short on explaining the options. For example, the clamp can be adjusted to three different positions to accommodate different desk thicknesses, but I needed to discover this myself when I found that the jaws of the clamp would not open wide enough for my desktop. The manual doesn’t mention this feature in words or pictures at all. It also fails to point out the cable clamps that I mentioned above as a very convenient feature. Maybe I have a greater than average number of cables and cords plugged into my iMac but I found the cable clamps too small for my needs and had to supplement them with hardware store cable ties. I would have also liked to have some warning of how unbalanced and ungainly the iMac and arm sub-assembly is when trying to slip it over the post clamped to the desk. I strongly recommend two people for this job. 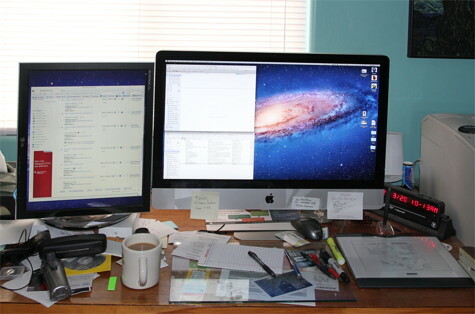 Dropping your 27″ iMac could ruin your whole day. These are small gripes that could be easily addressed with a properly inclusive manual/installation instructions. 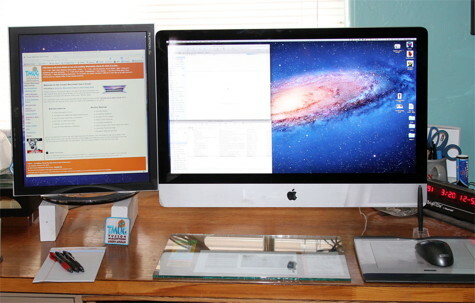 Overall, the Freedom Arm for iMac is a great addition to my desk that helps me move one step closer to the nirvana of a clear desk and the clean conscience of a proper files person.